Illness and Christmas have kept me out of the shop for any serious work. There is a bright side, though. All the forced down time presented an opportunity to catch up on a lot of woodworking reading. A Google book search like this one will show you the titles I have been perusing in addition to my own small library. I have been specifically looking at beginning woodworking. I wanted to see how authors broached the subject with their would-be students/readers. 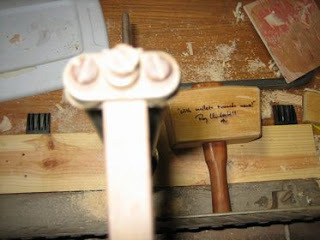 Some write about tools, some write about sharpening tools, some write about mind set, and then some write about spiritual satisfaction to be found in the working of wood. After the introduction, they go on to write about the mechanics. 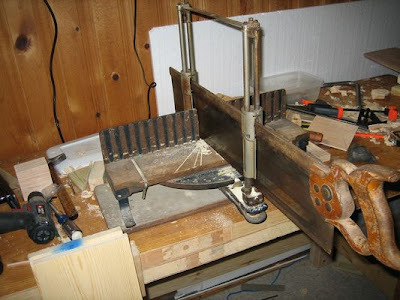 There is a commonality among all I have read and personally experienced: the basics of woodworking begin with work holding. Present masters may lecture otherwise, or they may agree. When it gets right down to it whatever your philosophical bent, you eventually have to put tool to wood and that wood needs to be held in place. I outgrew my current vise before I ever installed it. 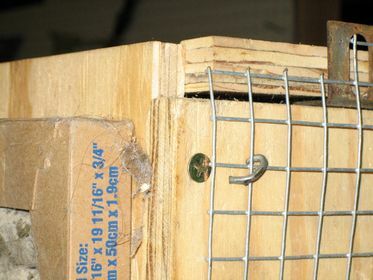 My amateur advice is to make sure you have a way to hold the wood, even if you are only building birdhouses. COMING SOON: pictures of the pint size Roubo build. Time for the first annual wrap up of who in the wood world got my money this year. I'm sorry, a real writer would say something like 'read on to find those vendors most deserving of my scant woodworking budget for 2011'. Although that phrasing barely passes muster with an editor answerable to advertisers, it is still untrue. If you haven't figured out by now, I am a very pragmatic person (parsimonious, frugal, cheap, etc.). As such, I spend money where I get the most value. Do not confuse the concept/term 'value' with 'inexpensive'. The following vendors are in no particular order and I am making no effort to describe all of the purchases made, but I am adding notes of Stuff I found interesting. Owl Hardwood Lumber They are used to people like me. They leave us alone as we wander aimlessly about shuffling boards measuring infinite dimensions in the grain. Plus I'm told I have a rather menacing look about me. Menards. Admit it, you know you want to. Klockit online. They have a free plan every month. The hardware kit only costs a couple hunnert. Huh? Lee Valley. Or is it Veritas? I wish they would make a decision. I really want their dual marking gauge. Hopefully they will be on the 2012 list. Woodline. Not too happy with the purchase, but it is my fault, not theirs. Woodcraft. I love their knife blanks. Highland Woodworking. Hey, don't forget to enter their latest prize drawing! Amazon. Do you really need the link? Henry. Shooting is relaxing; good for thinking. McFeely's What can I say. I take my feathered cap off to these folks in my best Shakespearean bow. With extra flourish. If you are not a customer, get the catalog. Lie-Nielsen. Even the packaging is cool. How often do you get to say that? 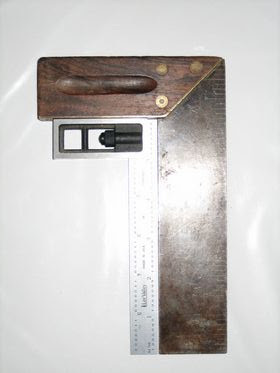 Gramercy Toolworks. Chris Schwarz gushed about their retro card stock 'catalog' they recently mailed out. I was feeling all left out and stuff and then the next day I got a copy. I'm not prone to keeping marketing literature, not even for gerbil fodder. However, I hung this thing up by my desk; novel and cool must be acknowledged. 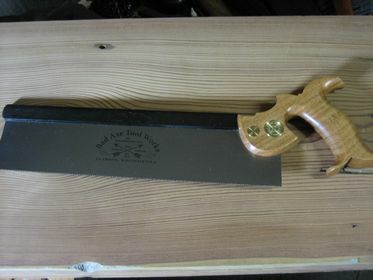 Bad Axe Toolworks. I'm sure I'm ripping somebody off, but I'm giving my 2011 Woody award to Bad Axe Toolworks. I dropped some serious coin on their new 12" hybrid saw. I do not regret any penny. Believe me, I do NOT say things like this lightly. Writing an end of year summary may be trite, but they are easy, hence their prevalence in publications. Heck, all you have to do is recap what you have already done. Sometimes a simple cut and paste is all it takes. This is my ode to end of year laziness. Best wishes to all in 2012. Apologies for the larger than life photo and my poor photography skills. I'd blame the camera if I thought anyone would believe me. Above you see the small squares I have been using for a long time. The brass and rosewood number is a True Value branded generic square that I paid a quarter for years ago. The supposed backstory is this square served faithfully for nearly thirty years; I highly doubt it, but who knows. The smaller square is from Lee Valley and is two years old this month. The highly overlit picture is my attempt to show the small gap between the two squares at the elbow. The True Value square is off by about 1/32 of an inch over six inches. As near as I can figure, the True Value square has been dropped one too many times. I received an early Christmas present. 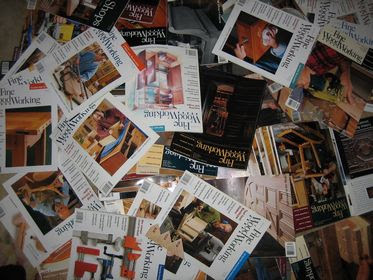 Not too long ago I put out a call on Freecycle for old wood working magazines and books. My expectations were not high, but what I received surpassed wild dreams. 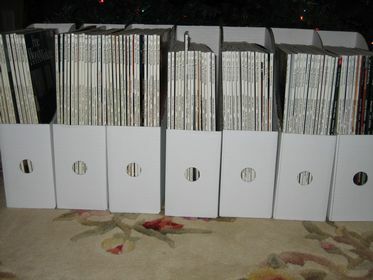 I present to you twenty years of Fine Woodworking magazine from 1987 through 2007. A complete stranger, yet fellow woodworker, saw a chance to pass on a cache of knowledge to another generation. 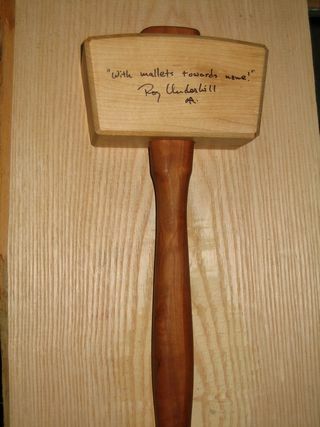 I am very thankful for the gift and hope to one day earn it before passing the collection on to another woodworker. Like the mountain folk in The Original Caste's "One Tin Soldier" I have an intangible treasure; a trove of knowledge that is simple to grasp and yet seemingly impossibly deep. The simple act of sorting the magazines generated numerous ideas for future projects. The Organized Collection. Under the Christmas Tree. As Monty Python says, and now for something completely different. The concept of Freecycle is simple: keep stuff with life left in it out of the land fill. The requests and offers are as varied as the human condition. Several times upright and baby grand pianos have been offered; I would have one if there were enough local friends to impose on. Have you ever experienced pristine driven snow on a mountain top? I have. The snow may be pure, but it is generally uncomfortable to see it. But this post is not about mountain sojourns and existential reflection. I have an air cleaner in the outside shop that was built about two years ago. It ain't pretty, but it keeps the dust down. This build is the epitome of pragmatic woodworking. Everything is reused from other sources. 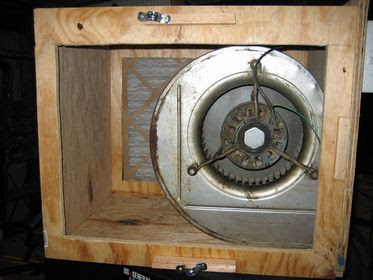 The genesis of the air cleaner was a new furnace in the house. With something like this project in mind, I told the installers to leave the motor from the old unit. The motor then sat around for several months until I was making some picnic tables out of treated wood. The machinery kicked up what I consider a toxic cloud of treated wood dust. I often say that laziness is the mother of invention, however in this case, necessity truly was the motivation behind this build; nobody wants to breathe that stuff in. The first design plan consisted of 'fit the box around the motor'. 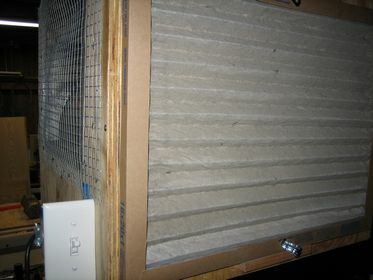 The more considered design is based around the filters from the new furnace. Buying the HEPA filters for the house, and reusing them in the garage is a very sensible plan--proven by the test of time. 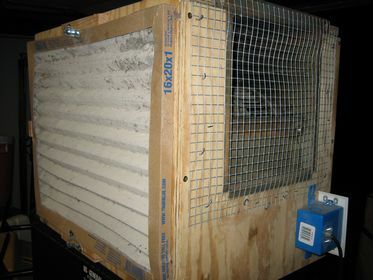 The filter size is 16X20X1 and the resulting plywood box is 21 5/8 deep, 17 3/4 high. and 16 1/4 wide. 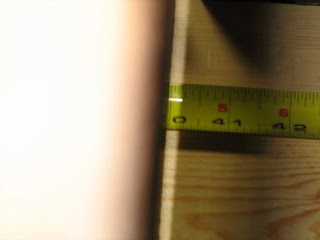 As you can see in this photo, the joints are simply glue, screw, and 'somewhat close' dimensions. I won't go into detail about building the box itself; if you need that level of detail then you are worse off than me and should start with Golden Books Introduction To Wood. Just kidding. The box really is nothing special. I started with four sides cut to dimension: front, back, top, and bottom. I bought six Craftsmen corner clamps from yard sales over the years and they once again proved quite valuable in aligning and assembling these four panels. The sides were left off to dry fit the motor before final assembly. Cut outs for the motor and the two filter sides were labeled right on the surface and cut with a jigsaw. Roughly. But not so rough that the area around the motor could not be sealed with silicon. After all, the only air you want is what the filter lets in. The motor is wired for a two stage control. In haste, I skipped the fancy wiring (read 'didn't want to spend the money') and direct wired it using a found electrical box and a single pole 15 amp light switch. Did you know that you can score and crack an outlet faceplate just like a sheet of drywall or glass? Well, you can, as you can see below. I digress (don't you hate it when authors hide a snarky sidebar with the words "I digress"? 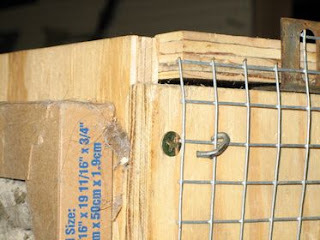 ), the electrical cord is a standard computer type with the house shaped end snipped off. The clips used to hold the filters in place are 1/2" conduit holders found at the bottom of my electrical toolbox. They are screwed down by hand for a friction fit. All the clips have to do is keep the filter from falling out when the unit is powered off. This air filter works so well that I often use it like a dust collector. That is, "on" when the tools start and "off" soon after using the tool. For two years the air in the outside shop has been as pure as the driven snow due to a couple hour build dictated by necessity.